Wazua » Investor » Offshore » Bitcoin: Does it have a future ? Bitcoin: Does it have a future ? We tend to overestimate the effect of a technology in the short term and underestimate the effect in the long term. "Forecasting technological change is almost impossibly hard and nobody — yes, nobody — is an expert at it. The only sensible course is to be wary of the initial hype but wary too of the later scepticism." Case in point. Irrational optimism that fuels greed. Today marks the day, The Bitcoin protocol has been running for 10 years. The first Bitcoin block was mined on January 3rd, 2009 12:15 PM CST. In just a decade, Bitcoin has become the most secure and robust transaction settlement network in the digital age, allowing for truly borderless and uncensorable value transfer. Let's see what 2019, and the next decade, holds. BTC is nothing short of a miracle,any young man or woman who doesn't get a HARD ON from the above stats,lazima kuna shida mahali! Basically STOs are going live next week....the perfect on-ramp to the crypto world. "guaranteed returns of 10 % monthly"....SCAM,keep off. Ata wao wamejaribu. Wazuans were not born yesterday. Totally agree. The new trend of blockchain technology still always on. But I think we have to wait sometime then everything will move back to balance again. Let us see on the chart. A firm bottom now set in bitcoin at about 3410.25. 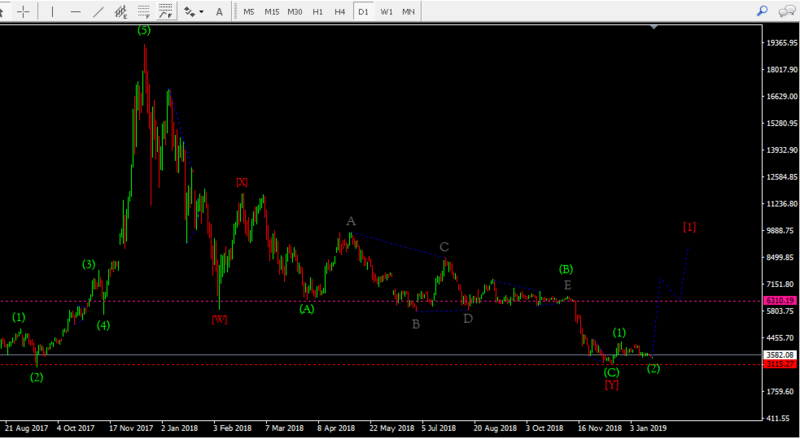 Expecting a strong upward rise to 6310.19s to complete wave (3). I met a KU student in cyber (that was November 2018) and was bragging how she's bought shitcoin by the name Kencoin. She told me she'll be super rich in coming years. I blew the whistle pointblank "you have been scammed, pole sana" Hakuamini. Your invaluable charting always appreciated. The multi-month descending triangle with 6k as the floor unsurprisingly broke to the downside,am seeing a replay of the same with the 3200 as the floor.How I see it,the only thing going for the bulls is the 200WMA support. This article might age well,or turn out to be the most absurd Bitcoin argument.I wager on the former. I ask again: what can I buy with a bitcoin? crazy stuff guys go through while chasing to be rich or die trying.